NOTE! I’ve discovered an occasional hiccup on the new site, in which for a few accounts, clicking on their class ends in an error code. That requires a little manual work from me – which I’m happy to do for you – however, I’ll be out for a few hours today (Sat afternoon Pacific time). I’ll get to any requests as soon as I return. Thanks! I’m excited to be sharing…finally….two new classes I worked on very hard for you! 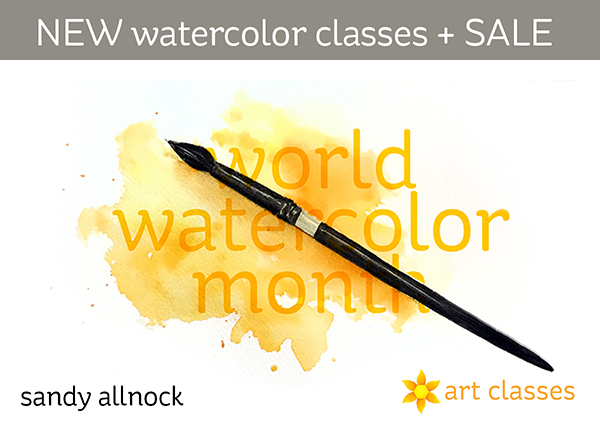 In celebration of World Watercolor Month, I’m also giving you a couple presents….sales! 15% off for the entire month, using coupon code WWCM at checkout! Old classes as well as new. All classes are HERE. 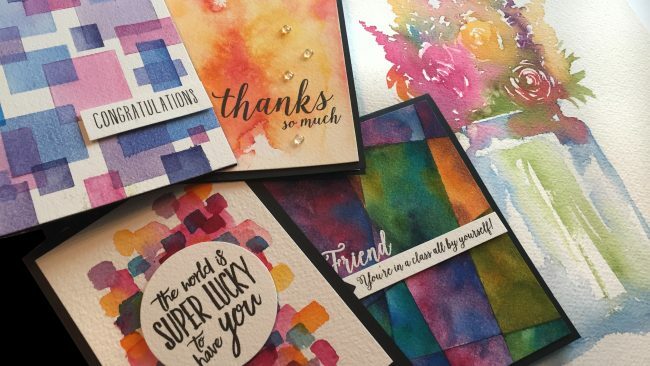 10% off at Ellen Hutson using coupon code worldwatercolors (all lowercase and one word). It’s good on everything in the store except the BCRF Fundraiser and is valid through July 31st. This class is for people who don’t care to learn how to paint an object, but want to make cards with pretty backgrounds. Lots of fun and easy techniques, and you can try them with whatever watercolors you have. Watch the trailer below or click HERE to see it in HD on YouTube. This intermediate class teaches you how to create lots of different kinds of beautiful loose flowers – along with vases to put them in! Watch the trailer below or click HERE to see it in HD on YouTube. And because Ellen’s a dear friend, she asked if I could kick off the month on her company’s blog. I couldn’t resist! 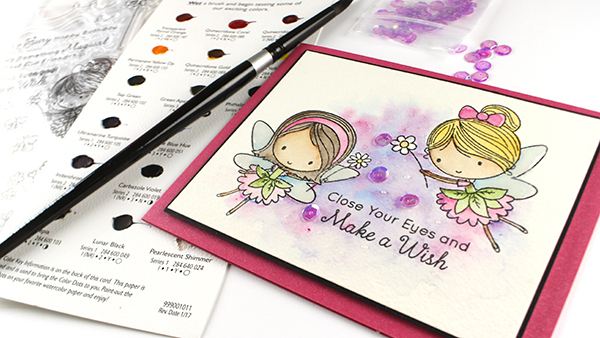 And this Fairy Happy stamp set from MFT didn’t fit in my schedule here on this blog, so it was a great time to share it over on her blog instead! Check it out today over HERE. Such great classes Sandy. I hope to take one (or two) sometime, I so wish I could now but one day I will. I love your fairy card, its just precious! Sandy, thanks for these video glimpses of your water color classes and the info on the Ellen Hutson sale. The “fairy” card you did for Ellen is so sweet. Happy world water coloring month!